An Australian man was arrested after he set himself on fire and caused an estimated $110,000 of damage when he lit a cigarette while siphoning gas. Police responded to reports of a fire in a parking lot in Millicent, South Australia last night and found a man nearby with burns on his legs. 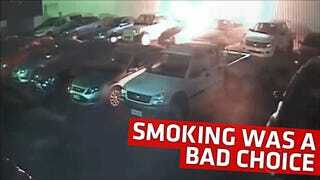 CCTV video shows he was siphoning gas when he lit a cigarette, catching himself and a number of cars on fire. The parking lot owner gave an interview with Channel Ten Eyewitness News, stating that they were lucky the fire was put out when it was. He was trying to get the fuel out of the car by punching a hole in the tank - that's when the explosion happened. Adelaide Now reports that police arrested the 26-year-old suspect on charges of arson and illegal interference with a motor vehicle.